A maintenance technician equipped with Onsight software and an Olympus videoscope, calls the engine manufacturer for guidance on next steps. ARLINGTON, VA--(Marketwired - July 01, 2016) - American forces in the Pacific during World War II faced challenges never before experienced by the U.S. military. From the sheer geographic expanse of the theater of operations to the reliance on naval strength, this piece of the war is critical to understanding how the conflict shaped our history. To bring this into the classroom, applications are being accepted now through September 2, 2016 for the 2016-2017 Understanding Sacrifice: World War II in the Pacific Teacher Institute program. Created in partnership between the American Battle Monuments Commission (ABMC), VA National Cemetery Administration, National History Day® (NHD) and The Roy Rosenzweig Center for History and New Media (RRCHNM) at George Mason University, this program creates a teacher's institute that helps teachers create and develop lesson plans and teaching ideas, with a specific focus on ABMC and NCA sites and resources in the Pacific. "We want to create avenues for teachers and students to understand the war-time service of our Greatest Generation," said ABMC Secretary Max Cleland. "And programs like this ensure the service and sacrifice of our fallen from World War II are never forgotten." The team of education, history and technology experts from NHD and RRCHNM will guide 18 middle and high school teachers in the task of developing curriculum based on solid scholarship, and integration of common core and state standards. These materials can then be adopted by schools, districts or states to create a history lab environment in which educators and students "do history." "Teachers are the greatest asset to any student and by empowering teachers to broaden their methods and tools, we also improve the learning experience of students," said National History Day® Executive Director Dr. Cathy Gorn. "This institute helps empower teachers by taking them to the places where history happened and allowing them to see where these fallen heroes are memorialized." Participating teachers will engage in a year-long study through webinars, readings, and discussion groups. They will research an individual service member buried in one of the ABMC or NCA cemeteries and create an interdisciplinary lesson inspired by topics drawn from ABMC and NCA resources and materials. The resulting research and lesson plans will be made available online. This education partnership is the first of its kind between ABMC and NCA. "We are truly excited to expand VA's Veterans Legacy Program by providing educators with an opportunity to bring to life stories of Veteran's service, sacrifice and courage. We look forward to enhancing our mission to memorialize Veterans through this unique partnership," said Interim Under Secretary for Memorial Affairs Ronald E. Walters. Established by Congress in 1923, the American Battle Monuments Commission commemorates the service, achievements, and sacrifice of U.S. armed forces. 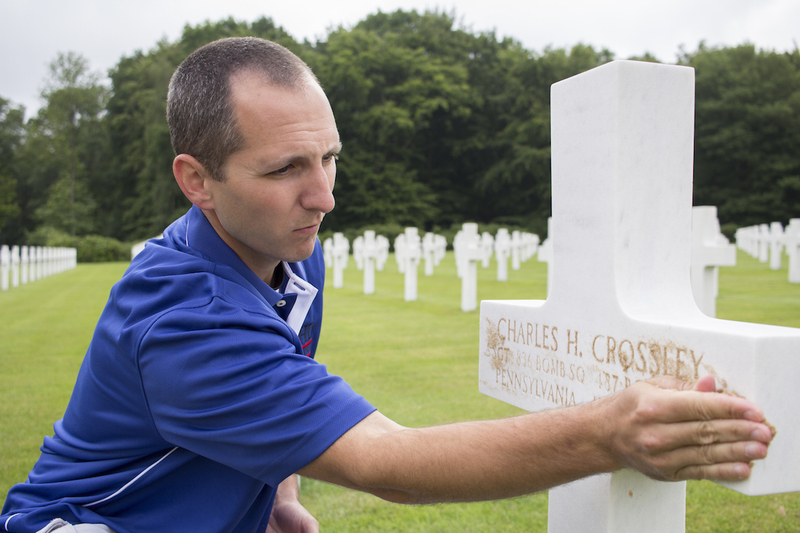 ABMC administers 25 overseas military cemeteries, and 27 memorials, monuments, and markers. Established in 1974, VA's National Cemetery Administration (NCA) operates 134 national cemeteries and 33 soldiers' lots and monuments sites. More than 4.3 million Americans, including Veterans of every U.S. war and conflict, are buried in VA's national cemeteries. For Veterans not buried in a VA national cemetery, VA provides headstones, markers, or medallions for placement in private cemeteries around the world. National History Day® is a non-profit education organization based out of College Park, MD. Established in 1973, National History Day® seeks to promote the learning and teaching of history through a variety of curricular and extra-curricular programs that engage over half a million secondary students around the world each year. More information is at nhd.org. The Roy Rosenzweig Center for History and New Media at George Mason University uses digital media and computer technology to democratize history -- incorporating multiple voices, reaching diverse audiences, and encouraging popular participation in presenting and preserving the past.